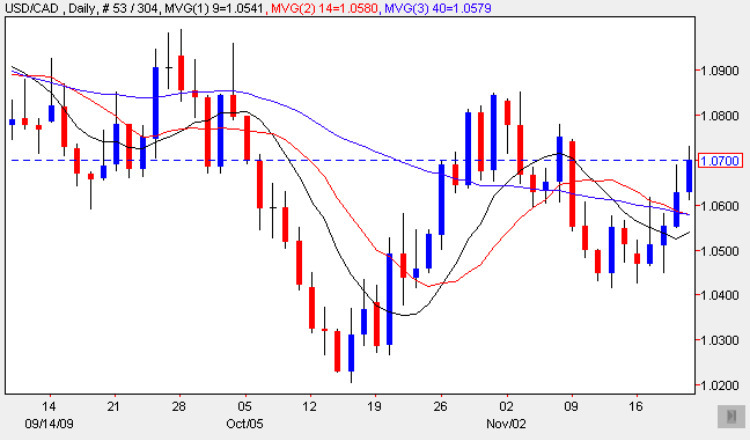 A positive end last week for the usd to cad currency pair, which duly confirmed the inverted hammer signal of Tuesday with a strong move higher for the remainder of the week, and ending on Friday with a relatively wide spread up candle, which once again approached the deep area of potential price resistance immediately ahead in the 1.07 to 1.10 price region, an area that must be breached if there is to be any sustained recovery for the pair longer term. With Friday’s candle confirming that of Thursday with a hold above all three moving averages, this is a positive signal, however given the deep bearish nature of the chart, and the failed attempt last time to clear this technical area, then for longer term trend trading we need to take a wait and see approach. Should this level be breached then we can assume that a degree of US dollar bullish sentiment has returned, helped possibly by some intervention either directly or indirectly from the FED given last weeks unusual and somewhat surprising comments from Ben Bernanke which caused some alarm to US dollar bears! However, as technical traders we must always rely on our chart reading, with the first rule of technical analysis being that everything in the market is reflected in the price on the chart, no ifs, no buts and no maybes! So technically the inverted hammer has been confirmed as a trading signal, but with the strong resistance now directly above, it will take some considerable momentum to pierce this deep area of price consolidation, and until this happens the picture remains bearish for the usd to cad. The only items of fundamental news for the Canadian dollar this afternoon are Retail & Core Retail Sales which are forecast to come in at 0.6% and 0.4% respectively, while for the US the market will be taking stock of the Existing Home Sales Date which analysts are forecasting at 5.71m. help you with your forex trading – so good luck and good trading.